Admission to the reception, scheduled from 5 p.m. to 7 p.m., is $10 for Chamber members and $15 for non-members. Registration is required. 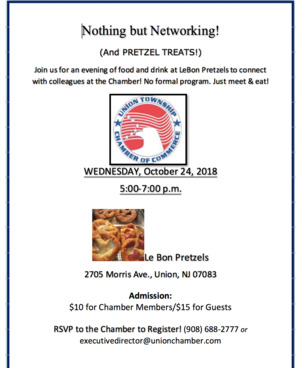 To register, please contact the Chamber at: executivedirector@unionchamber.com, or (908) 688-2777. The Union Township Chamber of Commerce is a professional association dedicated to strengthening, uniting, promoting and representing members businesses located in Union and the surrounding area.